Some new photos of the shop now we are open. We have been open for nearly two weeks now. The response has been great. We are mastering ‘the beasts’ (the coffee machine, till and computer system). If you have not been in to see us we’d love to see you. If you have been in do come again; the book stock is changing everyday as we order new titles. We are building up our stock of fiction with carefully selected titles. It will change rapidly over the coming weeks. 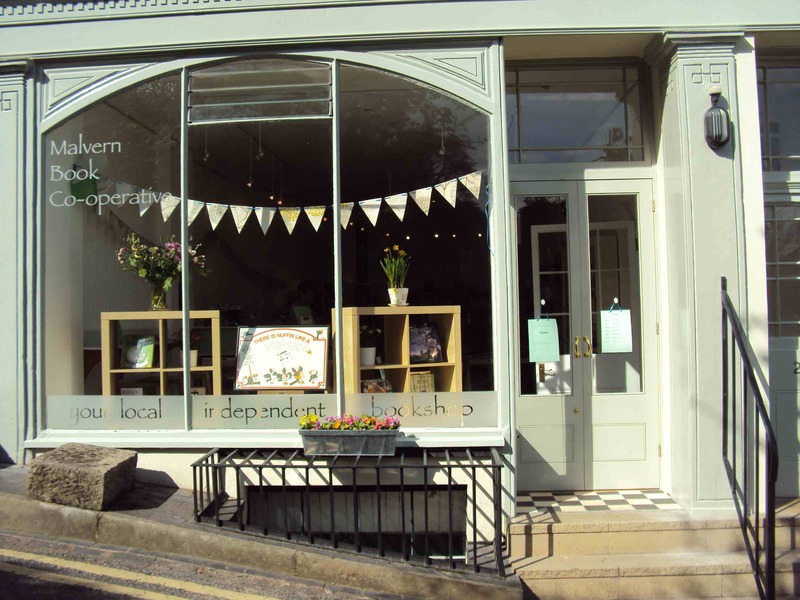 The shop front looks great in the sunshine – and pretty good in the rain! In the fiction room there is a quiet place for reading and having a coffee. Well we are open! Day one trading complete and members will be happy to know that over £500 will be in the bank tomorrow morning! Staff were frazzled but happy at the end of the day. On Wednesday the rest of our stock will arrive and we hope to open the second room. This stock will be the fiction for grown ups ( I can’t bring myself to say ‘adult fiction’ as that has too many smutty connotations). As of today we have a feed where we will post quick updates and offers etc. You can follow us @malvernbookcoop . The next thing we would like is to prepare a list of members’ favourite books – we can recommend them to our customers! If you post them here with a short recommendation we can order copies to stock in the shop. If you can’t choose just one recommend more! Shop fitting in full flow! Well things have been moving on quickly since the public meetings with applications coming in steadily! We have now sold about 80 shares and so we are progressing nicely. If you are interested in buying shares then please send your application to us at the shop – 2 St Ann’s Road and we will be delighted to process it. Once this is done we will send you a confirmatory email/letter and issue a share certificate later. Things are also happening in the shop. We have sourced shelves which will be collected soon and installed after a lick of paint. A joiner is coming in to build us a counter and the first book order has been placed! We are now planning our opening which will be during the easter holidays – date to be confirmed. All very exciting! So thanks for all your interest and comments. Please keep ideas and offers coming in (we have had an offer of a laptop and PC so thanks). We would love to hear from you with ideas for events and would welcome any offers to run one of these. We will update the blog again soon with news of our opening date. Huw & Jenny Foxa… on Trading Day 1! malvernbookcoop on Trading Day 1! Ella Dugdale on Trading Day 1!